The Post-Reformation period in England provides us with some of the most interesting examples of wall painting. After the Dissolution of the Monasteries many Renaissance mural schemes were executed in domestic settings. Interesting examples of domestic wall paintings are to be found at The Ancient House, Ipswich, 44 High Street, Bagshot and The Flushing Inn at Rye, Sussex. The latter two include murals with Royal Arms, which show the importance to the owner of displaying ones political allegiance at the time. Domestic wall paintings are some of those most at risk of accidental damage. 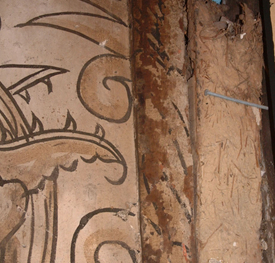 The Wall Paintings Workshop has been involved in a number of projects to rescue and conserve such murals at risk.